MILLVILLE, N.J. (Sept. 10) — The KWR team brought home a quartet of top-10 finishes this past weekend at New Jersey Motorsports Park, in Millville, N.J.. Kyle Wyman scored 6th and 7th place finishes aboard his Cambr/Stonecastle/KWR Yamaha in Superbike while Bryce Prince finished up 8th and 10th on his RiderzLaw/KWR YZF-R6. Mother nature offered up a variety of conditions throughout the weekend, with Friday practice hot and humid, but dry. Wyman finished the day 8th fastest on the Superbike while working on race setup, but with the forecast for rain for the balance of the weekend the hard work would prove to not make much of a difference, as Superpole and both races were ran in cold, wet conditions. The balance of the weekend was soaked with rain, remnants of a lingering tropical storm that swept the northeast. In the first practice session, Wyman posted the 9th fastest time on the slippery track before crashing, in what would be his third crash of the entire season. The KWR team repaired the bike in time for Superpole, where Wyman qualified 8th on the grid. 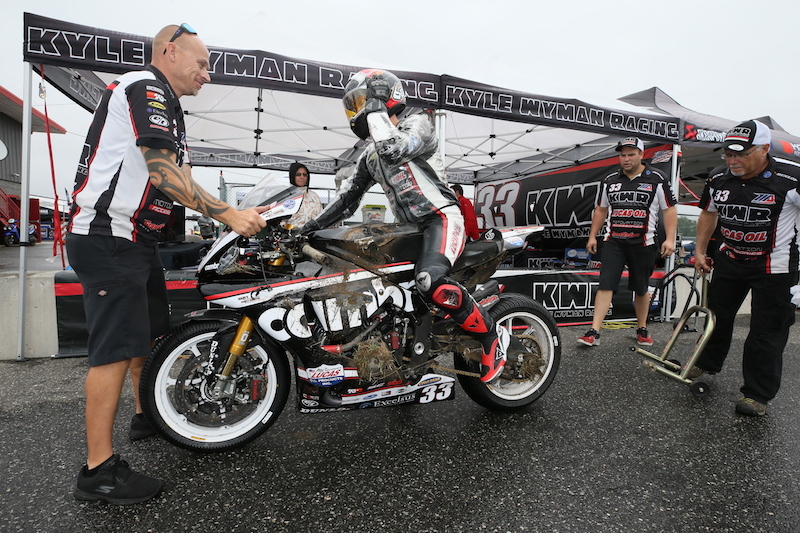 With high hopes for race one, the KWR team changed some settings on the bike to get Wyman more comfortable on the rain tires, but a costly miscalculation in the rear suspension setup put Wyman on track with a rear shock that was entirely too stiff for wet conditions. The lack in rear grip cost him dearly in lap times, but with the attrition in the race he was able to bring home is Cambr-sponsored Yamaha in 6th place. The KWR team went back to work, correcting the suspension miscue and making further adjustments to the forks. Wyman posted the 9th fastest time in Sunday morning warm up, but even with much wetter conditions he felt more comfortable on the bike. In race two Wyman got off to a fast start, picking up two positions in the opening lap to sit in 6th spot. In turn 10 on the first lap a rare mistake from Wyman sent him sliding down the track for the first time all year during a race. Wyman continued on from last place, and found the pace to be the third fastest rider on track, fighting his way up to 8th. With the battle for 5th in sight, and gaining time on them with each lap, Wyman made the same costly mistake in the same corner only to find himself picking up the bike from the same spot in the grass. Again, the bike was in rideable condition, and Wyman got back in the race without losing position. He would fight his way to 7th place to finish on the lead lap. 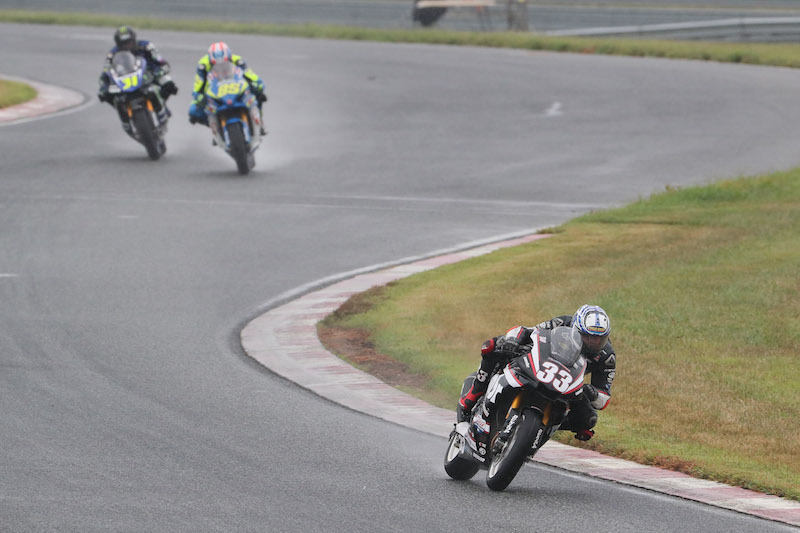 The shortened Superbike race, which ran only 18 laps compared to Saturday’s 23-lap main, would close out the weekend as Wyman fought to the very end. His last lap of the race was 4 seconds faster than anyone else on track. The season finale at Barber Motorsports Park takes place, September 21-23, 2018 in Leeds, Alabama. 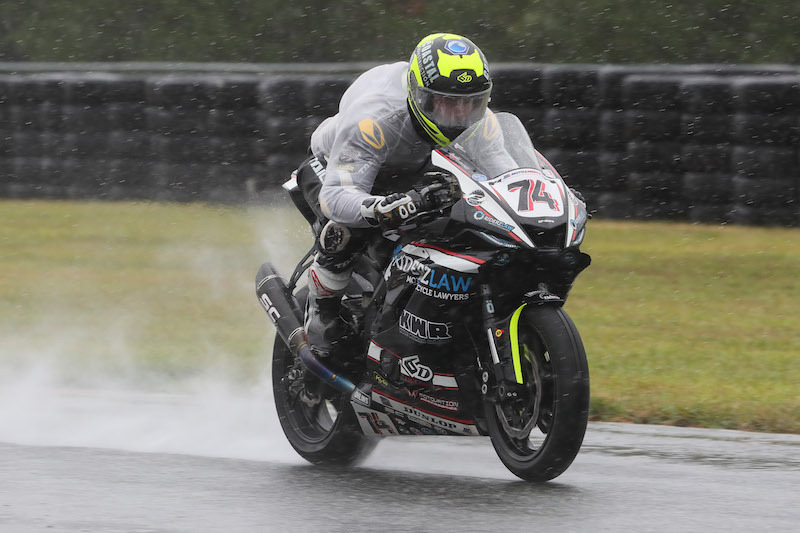 Coming off a hot streak of two podium finishes, the RiderzLaw/KWR rider Bryce Prince battled through the rain to score two top-10 finishes in New Jersey. The Californian climbed up to tie for 3rd in the Supersport championship as the series heads in to the final round.